After two years of tests and refinements, Chuck Close completed his first tapestry with the Magnolia Tapestry project in 2005. 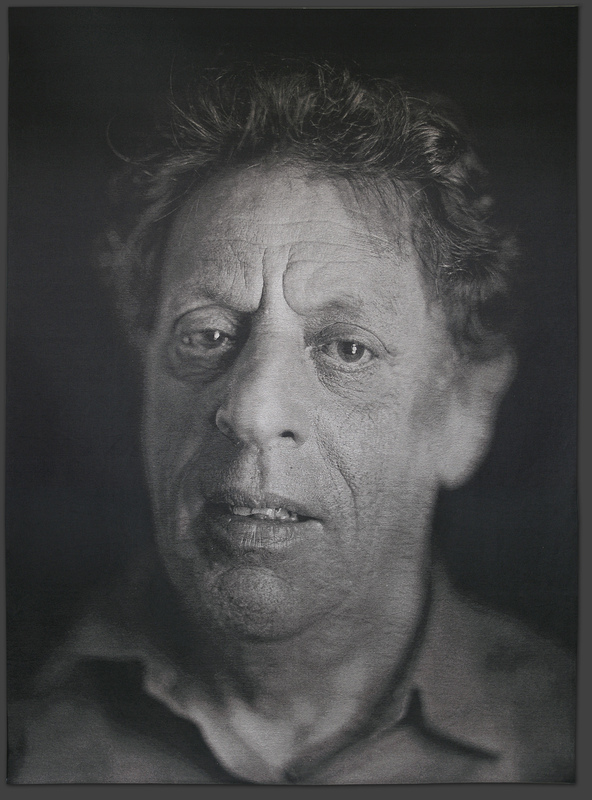 This monumental portrait is modeled after a photograph of Close’s longtime friend, the composer Philip Glass. Close is known for such portraits, which he creates by translating photographs into immense works of art using a grid and a module: a stroke of paint, a fingerprint, and now, a stitch. The black and white format is a revisitation of Close’s 1969 series in black and white, where the now iconic portrait of a young Philip Glass first appeared. From a distance, this contemporary depiction of Glass appears photorealistic; the viewer can clearly see the changes time has worked upon his face. Up close, the image dissolves into an abstract field of woven color and texture. Phil State I was woven in Belgium with a ten foot wide, double-head electronic Jacquard on a Dornier loom utilizing 15,360 warp threads of alternating groups of two colors. The weft threads are comprised of 8 repeating colors woven at 60 shots (threads) per centimeter (152 threads per inch). The Chuck Close daguerreotype was digitally scanned at the artist’s studio in NYC. The digital weave translation was created at Magnolia Editions in Oakland, CA.